Taraxacum officinale – The name dandelion comes from the French, dents de lion, which means “teeth of the lion,” and refers to the jagged edges on the leaves of the dandelion plant. Leaves: The deeply toothed leaves grow in a rosette directly from the root crown. The end lobe of each leaf tends to be larger than the lower lobes. Leaves grow from the base of the plant, appearing before the flowers. Flowers: A single cheery-yellow flower head, 2 to 5 cm in diameter, grows on a hollow leafless stalk. The flower heads consist of many ray flowers, surrounded by 2 rows of floral bracts, which are bent backwards (a helpful distinguishing characteristic). Main flowering is in spring, but scattered blooms continue all summer. Fruit: After bloom, white, fluffy, round balls of seeds appear. Parachuted seeds are easily blown apart by the wind or your own breath. 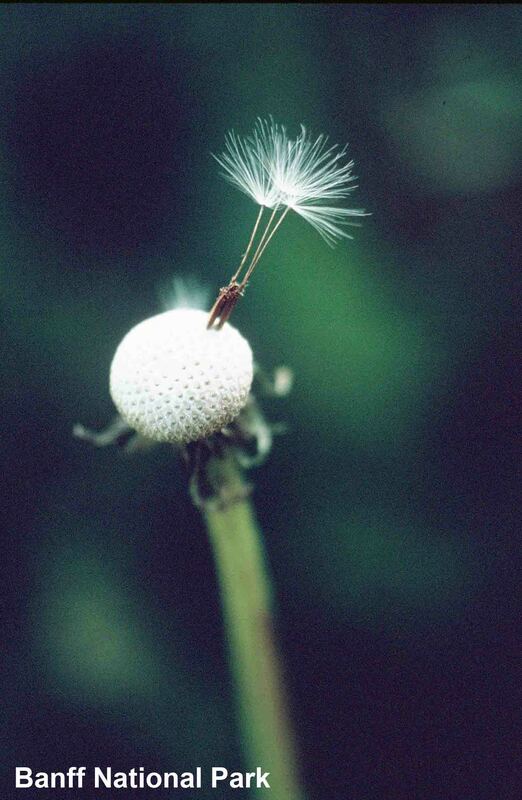 An individual flower head produces up to 200 seeds, and each plant up to 5000 seeds. Widespread on disturbed ground especially in settled areas across North America, the species is found from Newfoundland to British Columbia. This introduced species is common on lawns and in disturbed areas where vegetation has been removed or the soil is broken or cultivated. It is found at low to mid elevations. 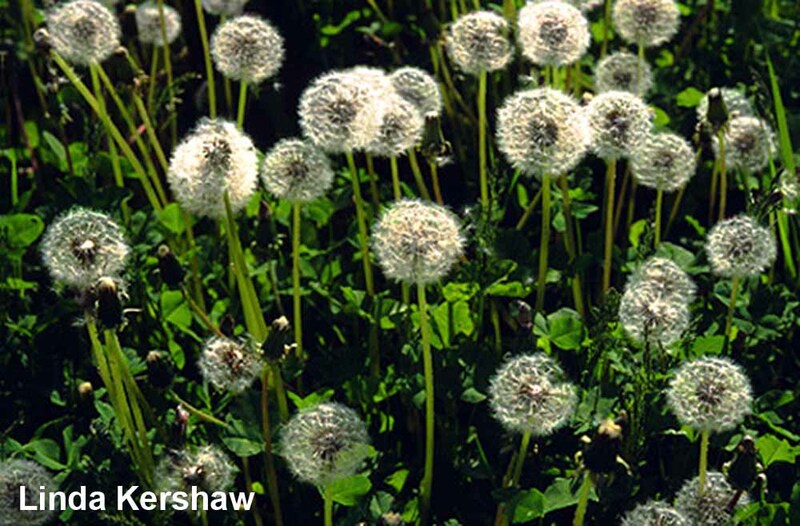 Find an area that will not be mowed until the majority of dandelion blooming is past and seeds have formed. Select a flat area away from buildings and mark a one by one metre patch of dandelions, using small sticks. 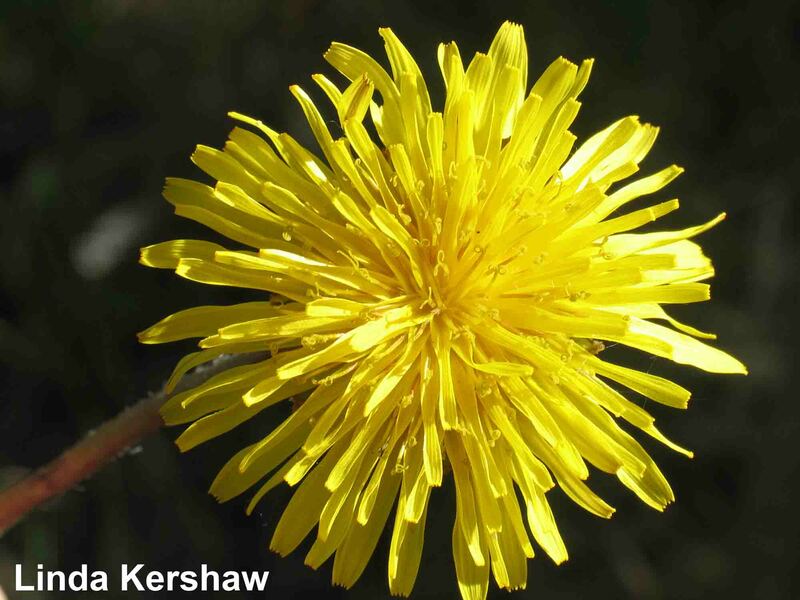 Note that one dandelion plant produces several blooms over time. Dandelion flowers tend to open in sun, and close in cloud and rain. During an ongoing warm period of cloudy weather before blooming starts, flower buds will eventually open. First bloom: Record the date when the first flowers have opened in the patch of plants being observed. Mid bloom: Record the date when the first seed-head opens in the patch of plants being observed, forming a white, fluffy ball of seeds. Many Taraxacum species make healthy seeds without normal fertilization, and the resulting offspring are then identical to the parents. This process is called “apomixis”. In apomictic species, fertile pollen is lacking. One of the earliest plants to bloom in the springtime. The seedheads attract seed-eating birds such as finches and pine siskins and small mammals such as mice and chipmunks. Flower heads are “ice-cream food” for black and grizzly bears. The flower heads are sensitive to light, and open in the early morning. 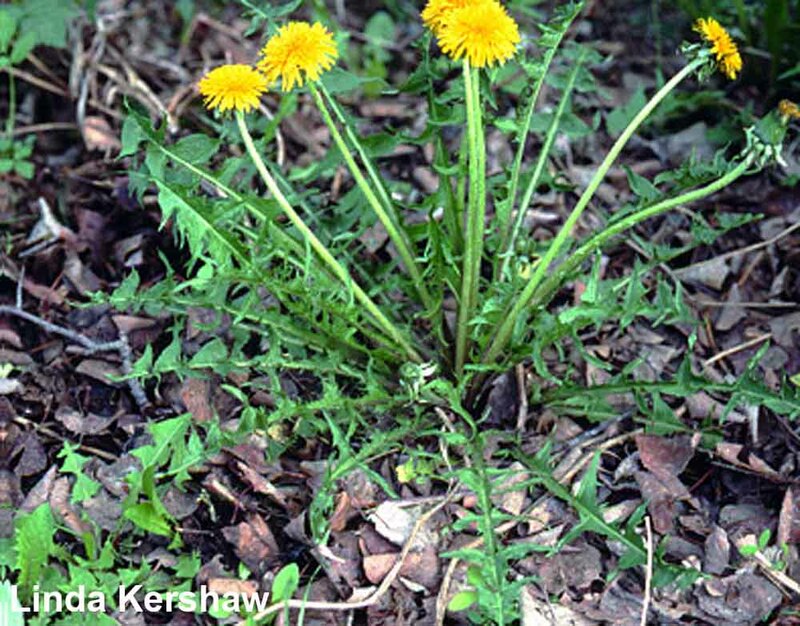 Dandelion is an alternate host for plant diseases such as aster yellows, beet ring spot and tobacco streak. Young dandelion leaves make a good vegetable green, either cooked or in salads. The roots can be dried and ground as a coffee substitute. Wine can be made from the flowers. Dandelions are rich in vitamins and minerals. The species name “officinale” is a word of early English usage meaning medicinal, and various parts of the plant have been used for their healing properties. A leaf decoction can be drunk to “purify the blood”, for the treatment of anemia, jaundice, and also for nervousness. The milky latex can be used as a mosquito repellent. The leaf has proven diuretic (hence the French name “pissenlit” meaning “pee in bed”) and also bile production-stimulating activities. Also, a dye can be obtained from the roots of the plant. The plant is readily eaten by livestock. Dandelion leaves are considered by Health Canada to be safe to eat, and dandelion root is already marketed as a registered diuretic drug in Canada. Much of the plant is imported from the United States, which seems unnecessary; dandelion is common and could easily be cultivated in Canada. There are commercial products containing dandelion root roasted and used as a coffee substitute and there is some demand for the young leaves and flowers for gourmet salad mixtures. Tip from Elke Blodgett: If you want to make sure you have tender leaves for salads for a long time, cover the plants with a sheet of plywood or something and the leaves bleach beautifully and don’t become bitter. They maybe lose some nutritional value, but you can add some green leaves to the salad mix. Place oil in frying pan and heat to moderate heat. Place flowers in pan and stir-fry for 5-7 minutes. Fry until thoroughly wilted. Sprinkle with garlic powder. Serve as a side garnish. Serves 4. Wash and peel the dandelion roots. Chop the roots and dip in pancake batter. French-fry in hot safflower oil until brown. A wok works perfectly. Add the chopped onion and serve. Serves 4. Variations of this recipe are staples in many Italian households. The sautéed greens are served as an accompaniment to meat or chicken, and leftovers are spread over focaccia. Sometimes the boiled greens are packed in plastic bags and frozen for sautéing in winter. This recipe is adapted from The Little Italy Cookbook, by Toronto food writers Maria Pace and Louise Scaini-Jojic (Warwick Publishing, $16.95). Trim the roots off the dandelions. Wash the leaves in several rinses of cold water to remove all dirt. Drain. Bring 2 quarts (2 L) of lightly salted water to a boil. Add the clean dandelion leaves and boil for about eight to ten minutes or until the leaves are completely wilted and tender. Keep pushing the greens down if they float above the boiling water. Drain and allow to cool. Squeeze the excess moisture from the boiled greens. 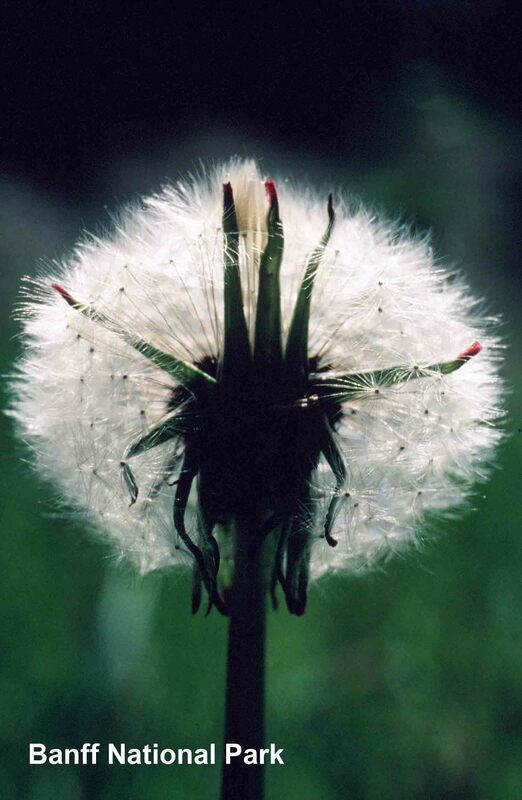 The dandelion will be greatly reduced in volume. If using long-leafed cultivated greens, chop them. Small greens collected in the wild will not need to be chopped. In a skillet, heat the oil and cook the onion over low heat until it softens. Season with salt. Add the garlic and cook a little longer. Add greens and cook until flavours are absorbed and greens are heated through. Taste; add salt if needed. Serve hot. Approximate nutritional content per serving: Calories 85. Protein 2 g. Carbohydrates 7 g. Dietary fibre 2 g. Sodium 153 mg. Mix the ground beef, egg, breadcrumbs, parsley, salt parmesan cheese, sour cream, nutmeg and pepper together. Form into small meatballs and set aside. Bring the chicken soup to a boil. Add the dandelion greens and cook gently. Rice or noodles can be added. When greens are tender, add meatballs and cook gently for about 10 minutes. Serve hot with french bread. Seeds need to be in the top 2 cm of soil to germinate. Dandelion was carefully cultivated by fur traders at Fort Churchill in northern Manitoba, to help balance a diet lacking in healthy vegetables. Early settlers were also known to tend plots of dandelions, protecting them with chicken wire from hungry ground squirrels (gophers). Unfortunately the plant has been considered a pesky weed of lawn and garden, and its virtues mainly ignored. Brown, A. 1970. Old Man’s Garden. Gray’s Publishing Ltd., Sidney, British Columbia. Lyons, C.P. and B. Merilees. 1995. Trees, shrubs and flowers to know in British Columbia and Washington. Lone Pine Press, Edmonton. Royer, F. and R. Dickinson. 1999. Weeds of Canada and the northern United States. Univ. of Alberta Press, and Lone Pine Publishing. Edmonton. Tilford, G.L. 1997. Edible and medicinal plants of the west. Mountain Press Publ. Co. Missoula, Montana. Ward-Harris, J. 1983. More than meets the eye – the life and lore of western wildflowers. Oxford University Press, Toronto.